The LSM(R)s (Landing Ship, Medium (Rocket)) were considered "interim" as indicated by the book's title because they were a stopgap measure by the U.S. Navy to provide close-in bombardment during amphibious invasions in the Pacific War. Twelve LSM(R)s, numbered consecutively from LSM(R) 188 to LSM(R) 199, were built as the Navy's first rocket ships by converting LSM (Landing Ship, Medium) hulls. A typical LSM(R) had 6 officers and 76 enlisted men. All of these LSM(R)s participated in battles at Okinawa from March to June 1945. 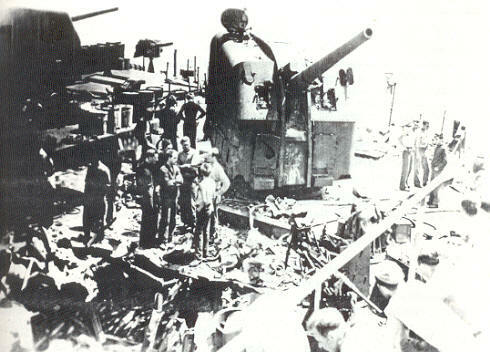 Japanese kamikaze planes hit and sunk three LSM(R)s and severely damaged another one. The attacks on these four LSM(R)s killed 60 and wounded 89 (based on numbers provided in book, other sources may have slightly different numbers). 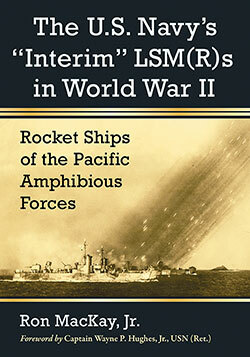 Ron MacKay, Jr., serves as historian for the LSM-LSMR Association. This extremely well-researched book surely is the definitive history of LSM(R)s with extensive chapter notes and bibliography. The history also includes many historical photographs, a glossary, four appendices, and an index. The narrative generally reads like ship deck logs, action reports, and other official Navy documents, which make up the main sources for this history. However, the book has many quotations from LSM(R) veterans that provide color to the rather technical and dry description in places. Inexplicably, LSM(R)s often patrolled the radar picket lines with armed rockets in launchers, though none was ever fired against Japanese aircraft. Seaman 1c Lawrence Willison on LSM(R) 197 recalled, moreover, "The Captain at no time explained to us why we were being used for this duty. I think everyone knew we were not suited for this kind of service, but we all did the best we could to do our part with this assignment." LSM(R)s of this command have been assigned to act as radar picket fire support ships during the period of time covered by this report. It is believed that these ships are not particularly suited for this duty. Since their primary function is to deliver rockets during invasion operations, it seems feasible that subjecting them to continued air attack will allow a secondary duty to seriously effect [sic] their ability to perform their primary function due to mechanical damage. They have no great value in combating the enemy air craft due to the absence of air search radar, adequate director control for the 5"/38 main battery, and director control for the 40 MM single guns. The fact that they carry a considerable quantity of high explosive rockets in their magazines presents another hazard. In general, it is believed that assigning them to this duty should be avoided since it means risking the operation of a limited number of specialized landing craft whose primary function is more closely coincident with screening operations. . . . LSM(R)s should be used more frequently for rocket harassing and close patrol of enemy beaches, prior to an attack. LSM(R)s should not be used as fire support ships for radar pickets against enemy aircraft. Despite the above recommendation, LSM(R)s remained on patrol at radar picket stations until May 21, 1945. LSM(R) 195 - Sank on May 3, 1945, at Radar Picket Station 10 after hit by a kamikaze plane. 15 killed and 16 wounded. Destroyer Little (DD-803) also sank at same Radar Picket Station with 30 killed and 79 wounded. Destroyer minelayer USS Aaron Ward (DM-34) also hit with 45 killed and 49 wounded. LSM(R) 194 - Sank on May 4, 1945, at Radar Picket Station 1 after hit by a kamikaze plane. 14 killed and 23 wounded. Destroyer Morrison (DD-560) also sank at same Radar Picket Station with 159 killed and 102 wounded. LSM(R) 190 - Sank on May 4, 1945, at Radar Picket Station 10 after hits by 3 kamikaze planes. 14 killed and 18 wounded. Destroyer Luce (DD-522) also sank at same Radar Picket Station with 149 killed and 96 wounded. For extraordinary heroism against enemy Japanese aircraft in one of the most outstanding actions of World War II. While on Radar Picket Station Fifteen off Okinawa, engaged in a task far exceeding that for which she was designed, as a member of a task unit composed of the destroyers, USS H. W. Hadley and USS Evans, and the LCS(L) 82, 83, and 84, she contributed greatly in repelling the overwhelming onslaught of one hundred and fifty-six Japanese suicide planes, all of which were destroyed; the LSM(R) 193 destroyed eight by her individual action. When the USS H. W. Hadley had been overwhelmed by enemy planes, abandoned by more than two-thirds of her crew and had been burning fiercely and exploding for fifteen minutes with complete loss of power, the LSM(R) 193, disregarding all hazards, courageously went alongside and saved this destroyer by putting out the fire, and in addition, rescued the majority of the crew and towed the stricken ship safely to port. Her courageous determination and effort added to and were in keeping with the highest traditions of the United States Naval Service. For outstanding heroism in action against enemy Japanese aircraft and suicide boats. While on an aggressive patrol off Okinawa, she engaged and destroyed three enemy suicide boats and assisted other vessels in repelling a determined air attack. Later, while on a radar picket station engaged in a task far exceeding her designed employment, while in company with a destroyer and another LSM(R), without air coverage, she successfully brought down three of eight attacking planes. When the accompanying destroyer was violently attacked and sunk within two minutes, the LSM(R) 189 proceeded at full speed to pick up survivors. While courageously fighting off further attacks during which she herself was hit by a suicide plane, she courageously rescued one hundred and fifty men of the destroyer's crew. Her courageous determination and effort were in keeping with the highest traditions of the United States Navel Service. Off western Okinawa at dawn on Mach 29, 1945, LSM(R) 188 got hit by a kamikaze aircraft carrying a bomb. The attack killed 17 men and wounded 32. The heavily damaged LSM(R) 188 did not see any battle action for the remainder of the war.